Thank you everyone who participated! It was nice to hear that you like the Whimsy Stamps as much as I do! Which means that Julialynn has won! "Never seen a skunk stamp but now thta i have, I want one;PJulia"
Congratulations Julia! Please contact me with your address and I will see that your package is sent off to you. And for all those who weren't as lucky, you can still get this little skunk with the big attitude at Whimsy Stamps. Whimsy has just released some more of these cute little critters and senitments. Here is a little peek of two of them with one of the sentiments! I coulsn't resist doing another step card! The seal is actually part of a larger stamp but I cut him out and created another flipper for him. All coloring is done with copic markers and I airbrushed the sky with my copic airbrush system and added some stickles for the bling factor! 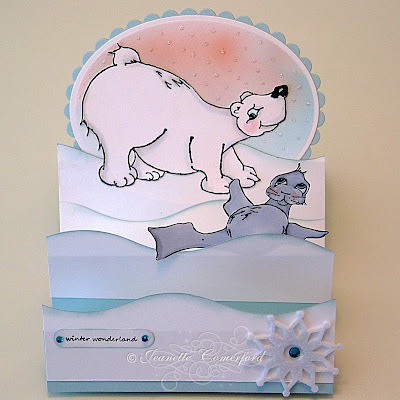 Also, my fellow Whimsy DT member Erin has some Whimsy candy on her blog. Hurry it is over on Jan 8th! Hope you like it and have a fantastic day! Jeanette this card is AMAZING! I love it!!! So cute with the seal and the bear and the layout and the ok the whole thing is perfect!! This is just adorable. I love the colors and the layout is awesome. Love the details you added. Amazing creation Jeanette. I want to have another go at one of these step cards. Your colouring is so perfect! waouh jeannette ta carte est sublime !!! j'aime beaucoup les tampons et les couleurs !! Magnifique carte Jeannette !!! par ce grand froid ça réchauffe !! !